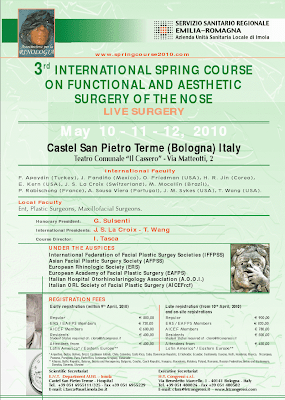 Here we are with our biannual appointment, the “3rd International Spring Course on Functional an Aesthetic Surgery of the Nose”, which will be held in Castel San Pietro Terme (Bologna) ITALY, between 10th and 12th of May, 2010. The official languages will be Italian and English, with possibility of simultaneous translation. We truly hope you will join us in Castel San Pietro Terme during the sunny spring of 2010.